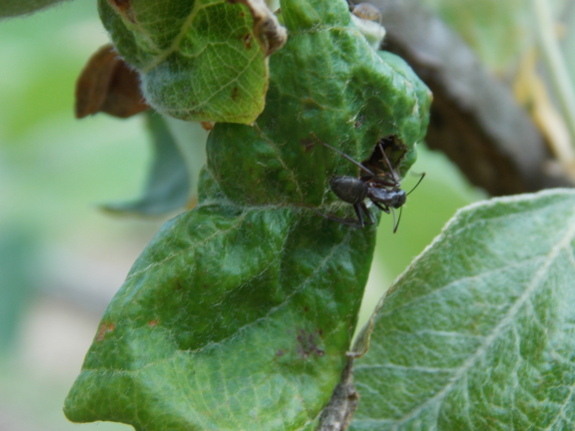 Apples are a magnet for pests and diseases, and there are various responses to this reality. Conventional growers just dose the trees with chemicals, while organic growers tend to use less-noxious-but-still-problematic sprays. Those of us who eschew even the organic sprays, though, have to get a bit more clever, and I start that cleverness off with variety selection. Our high-density-apple planting gave me a chance to try a lot more varieties than I could otherwise cram into our core homestead, and I'm taking advantage of that opportunity to see how each type of apple performs in our climate. 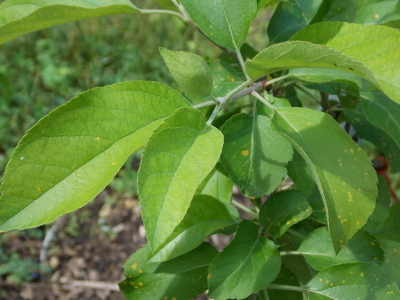 The apple disease that's been our biggest bugaboo in the past is cedar apple rust, and I tried to select only varieties that show resistance to the fungus. Still, I've seen the pretty (but problematic) orange spots on several of our new trees --- Sweet Sixteen, Grimes Golden, Pristine (ironic, huh? ), Mammoth Black Twig, one of our two Zestars, and Summer Rambo. All infestations are light to moderate, so I'll ignore it for now and consider ripping out these varieties if the fungus seems to be unduly affecting the trees' growth in the future. 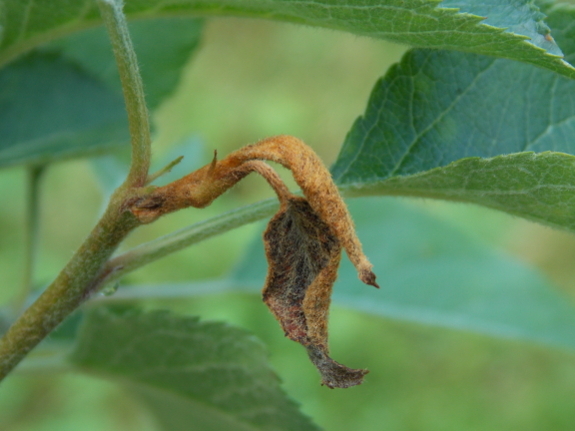 Possible root damage aside, I suspect the woolly apple aphids will be long gone soon. I started noticing the white fuzz less than a week ago, and when I went out to visit the trees Sunday, I saw mating ladybugs and eggs --- the predator insects are on the job. 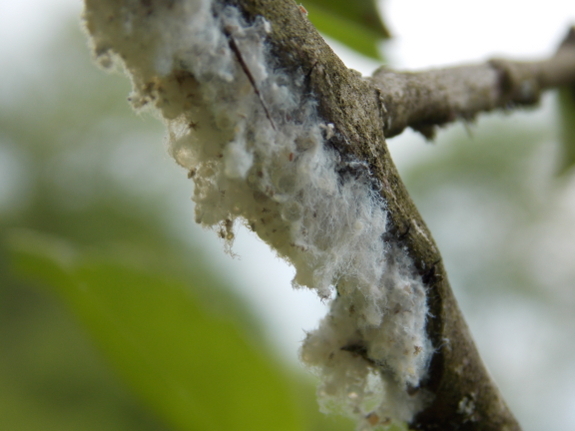 While we're on the topic of aphids, it's worth noting that the woolly apple aphids weren't on all the trees with cicada damage, just the Virginia Beauty. 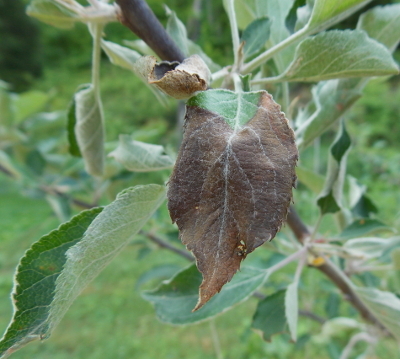 On the other hand, our Yellow Transparent, Winesap, and Enterprise sported a few curled leaves like the one above, which closer inspection showed were full of fuzz-less aphids being tended by large black ants. Once again, I'll let nature take its course here. 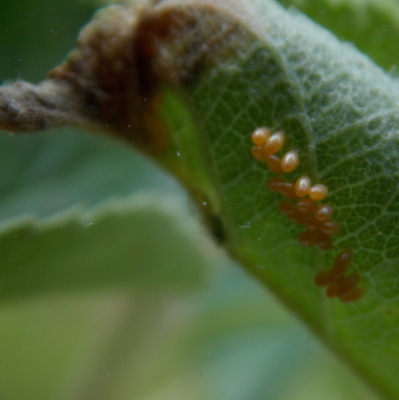 I've never known aphids to be more than a passing inconvenience in our diverse garden. More troubling is the dead leaf tips like the one shown above, which I'm guessing is the apple version of fire blight. As with cedar apple rust, I tried to select only resistant varieties, but apparently Enterprise is more prone to fire blight than the internet lets on. I'm not sure what to think about the few blackened leaves like the one shown to the left, which I discovered on our Winesap. Ideas? In case you're keeping track at home, all of this leaves just a few varieties completely untouched by insects and disease so far this spring --- Liberty, the dwarf Yellow Transparent, and Red Empire. So far, the following varieties have set fruit --- Virginia Beauty, Liberty, Yellow Transparent (the elder and the the younger), Enterprise, and Pristine. I'll keep you posted on how the variety selection pans out later in the year once we've seen how our trees hold up under their various stresses. Our chicken waterer isn't just for chickens. Ducks, peafowl, guineas, quail, turkeys, and even pigeons have enjoyed the POOP-free water. We planted two apple trees (among others) this spring, so learning more has been on my agenda. I just love this blog. Every single post is of interest to me, it seems! Great photos! I have camera envy! I think we are sort of fortunate in a weird way here, in that the area is so high amd dry that nobody gardens, and not much grows. Therefore, the pests havent found us. My tiny little garden last year was pretty much pest free except for a vole issue in one cold frame. No insect damage, might not be so lucky this year. 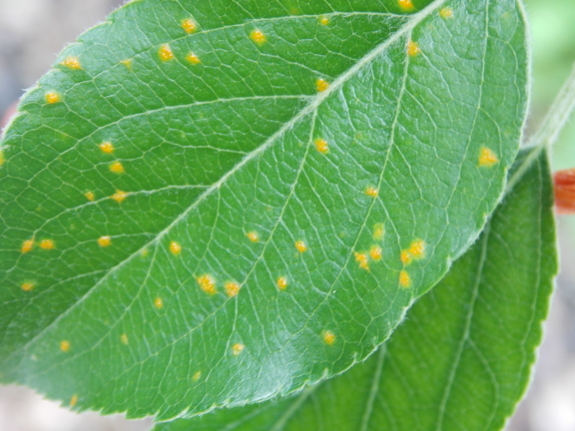 It is good to get a heads up on some of these fruit tree issues. We have two new, small little apple trees that I planted last fall... One cortland and one one thompson county king. ( didnt have ma ny choices by the time I got to the local grower in the fall). They both appear healthy, and are leafing out. The Cortland has blossoms galore ( wich might amount to about 24, since its so small) but the other tree has not one single blossom. Healthy leaf clusters, but nary a flower. Anybody have any ideas why no blossoms on an otherwise healthy tree? And I dont think they froze, because Ive been examining them closely as the buds broke.... Just no blossoms... .?? Deb --- I've noticed a similar thing at my Mom's house. She lives in the city, and there tend to be a lot fewer pests and diseases around. Definitely a benefit! About your bloom-less tree --- it's probably just too young. Dwarf trees bloom earlier, but apple trees usually have to be five to ten years old before they fruit (depending on the variety). We're only getting fruits on our non-dwarf apples for the first time this year, and the oldest ones went in the ground February 2009. It's a long wait, but hopefully it's worth it. 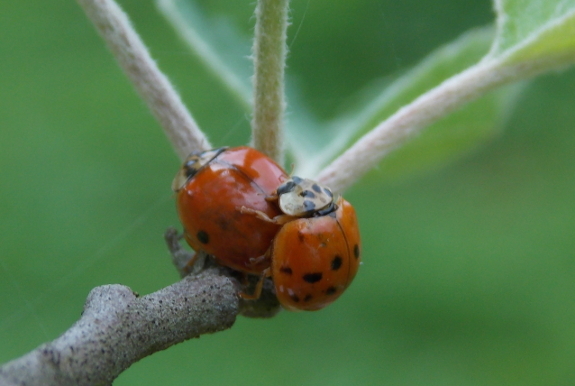 are you sure those are ladybugs and not Asian lady beetles...I have heard there is a big difference in that the Asian lady beetles are not natural predators to aphids.....just wondering. Heidi --- The Asian ladybugs are very easy to tell because they're more of a tan color instead of red. The photo got the light off a bit, so these look more orange than they are in real life, but they're definitely the good kind of ladybug.